Air Canada Boeing 767-300ER C-FMWU arrives at London Heathrow. Disclosure: As a past ultra-frequent flier on Singapore Airlines, I have developed above-normal service level expectations. So my reviews tend to be a little on the stiff side. However a thumbs-up from me reflective truly good service. On a recent trip from Bangalore to Dallas-Fort Worth via Frankfurt I flew Air Canada international for the first time in my life. 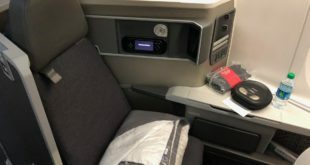 The first trip was from Frankfurt to Toronto Pearson on their Boeing 777-300ER and thanks to mother nature, and two very efficient and caring customer service executives at United and Air Canada in Boston, from Ottawa to London Heathrow in the Boeing 767-300ER. The trip was paid for by me. 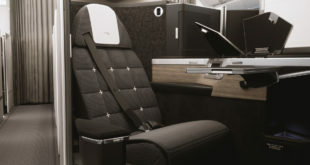 Both trips were in the Executive First Suites cabin product which the crew call “The Pods”. On the 777s the mini-suite seats are found in the airline’s two-class 777-300ER and all 777-200LR aircraft, in a four abreast 1-2-1 configuration, while on the Boeing 767 and Airbus A330 they are in a 1-1-1 three abreast configuration. Frankfurt to Toronto. AC873. Depart 10:00 Arrive 12:15. All times local. Boeing 777-300ER. C-FITW. Seat 1K. 29-Apr-2013. The seats open out to 191cm (6’3″) long in lie-flat mode, and is 53cm (21″) wide. 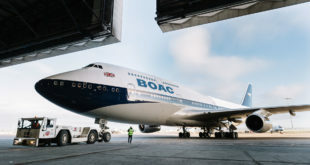 Each pod is equipped with a 30 cm (12″) touch-screen TV married to an Audio-Video On Demand (AVOD) in-flight entertainment (IFE) system, and fitted with noise-cancelling Sennheiser headphones. The seats also offer a single-pin audio jack for your own headset. Pillows and a duvet are standard. Seat 1K on the 77W lacks a window. Comfort of the seat is good. Lots of nooks for storing small items. Can get confusing for the first timer. Did not notice the plugged in Sennheiser noise cancelling headsets in the nook to the right of the seat. Fresh foam covers for the speakers are provided. Also did not notice the bottle of water tucked in left nook (see the second seat in the picture above). The amenity kit is minimal and nothing to write home about. The seat has nice padding not too firm, and not too soft. I had a comfortable sleep. The “pods” offer a sense of privacy, but are completely individual traveller focussed. There were some couples travelling on the flight and they had to keep getting up to talk to each other. Also the mini-suites do not offer too much of a window view, so any claustrophobia gets magnified. Was offered the obligatory hot towel, and it was better than what I have experienced on US carriers, but thinner and colder than those on Lufthansa and Singapore Airlines. A choice of water, orange juice or Champagne is offered before the flight. Unlike the forward facing seats of most business class which allow you to quietly switch on the flight path display and watch while the plane taxies and takes-off, the Air Canada screens are mounted on the side wall and must be opened 90 degrees for viewing. The crew comes around and shuts all the screens once the safety video completes. Post take-off, the drinks trolley is wheeled out and warm almonds accompany. I was overwhelmed by the extreme generosity of the Canadians when it came to serving alcoholic drinks. Wine, including the fortified Port which is around 20% alcohol, were poured like water, and one could quickly find themselves floating well above the aircraft’s cruising altitude if not careful. Since I sampled all the wines, I had to keep raising my hand to stop the crew from over-pouring the wines. However, I found the white wines also being served at almost room temperature. Something for Air Canada to improve on. Once the cabin is darkened, the funky blue LED lighting under the screen and around the seat give some very exotic effects. The meal service is a generous five course offering. A good selection of hot breads are offered, and the appetizer plate is switched out for the main course, and finally the dessert. It was almost shocking, that Air Canada, the national carrier of Canada, does not feature even one wine from Canada, in its wine list, which is made up of quaffable $6~$10 wines from Southern France, South America, and California. Nothing memorable. Given the strong wine culture in Canada, this should be something the carrier must look to improve. The quantity of food is ever so slightly on the lesser side, but you can make it up with some additional bread. Staff service is by and large good. I found the Air Canada cabin crew more responsive and hospitable compared to their US counterparts, and I certainly appreciated the crew’s effort to meet my request to serve my tenderloin as close to medium-rare as possible. It is something I miss on most Asian, and many European carriers who turn their meat to rubber by over-heating. Arrival at Toronto was decent. For a connection to the Toronto – Dallas Fort Worth leg, there was a long walk, and then a long wait to enter the US immigration pre-screening, since your name comes up on the screen only after your bags are put on the baggage belt and their photograph is available to the CBP officer. The US Immigration is followed by a stringent security but regular metal detectors. Immediately after security there is a very nice Air Canada lounge, equipped with the best business centre I have seen till date. Free computers, printers and photo-copiers. Even mobile phone printing, and internet printing. After almost 20 hours travelling, the first thing I did was take a nice, long, hot, shower. Finally refreshed I headed across to the food and drink section. Given that it was around 2:30pm by then, there was no food. Just some dry tidbits. The food was finally refilled around 5pm with salad, soup, and some hot food. Almost the whole lounge, including me, descended on the food like it was going out of fashion. Sorry, I was hungry. Went down the escalator to board my Toronto to Dallas-Fort Worth flight. By this time, the effects of jet-lag and 20 hours of travel started to take their toll. I do not even recall what I ate before passing out due to sheer exhaustion. It was a smooth arrival in DFW. Good job AC. Ottawa to London Heathrow. AC888. Depart 22:30 Arrive 10:15. All times local. Boeing 767-300ER. C-FXCA. Seat 8K. 09-May-2013. The counter agent staffing the United GlobalFirst counter at Boston Logan saw me coming, and decided to walk away from her counter, leaving me to wait for the BusinessFirst counter to open. I must thank that snooty woman for abandoning her counter, because Joanne at the BusinessFirst counter turned out to be very courteous and super efficient. Thanks to bad weather at Boston, my Boston to Washington Dulles flight was delayed and this would cause me to miss my United Dulles to London Heathrow connection. While she was thinking of options, I informed her that I remembered there was a Boston-Halifax-London connection on Air Canada. Joanne promptly contacted her counterpart at Air Canada in Boston, and in little over five minutes I had a new re-routed ticket Boston-Ottawa-London Heathrow. Thanks once again Joanne. The Boston Ottawa trip was a all-economy CRJ200. Very routine. I found the transit connection sort of odd. I had to go through Canadian immigration, pick up my bags, go through Canadian Customs, detour through a side door, check-in my bags in, again, for the London segment, undergo security, and then board the aircraft. Ours was one of the last flights to board. By this time, all the duty free shops were closed. Sorry Canada, you missed earning some duty free dollars. This time, I got the last seat, 8K in the cabin. May be it was the dark, may be it was just my mind and the hurried transit, but I felt slightly claustrophobic. You can judge from the photo below which shows the eye level view. The service on this flight, while decent was not as warm and hospitable compared to the crew on the AC873 Frankfurt to Toronto flight. It felt like the crew wanted to complete the service quickly. It was a professional service but very mechanical. Canadian generosity. A “small measure” of gin between the ice water and tomato juice. The main course selections for the dinner were good, and I must compliment the cabin team. This time I got my steak medium-rare and bloody. Just as a good cut of beef should be served. Lufthansa, British Airways, Singapore Airlines and Cathay Pacific should take some inputs from Air Canada and teach their cabin crews how not to overcook a nice piece of meat and turn it to rubber. Morning arrival faced the usual delay in the skies over London. Our flight did the obligatory race-track loops before getting clearance to land. After landing, we had to wait on the taxiway, as our gate was occupied by another aircraft that had a technical malfunction. After about a 20 minute wait we finally embarked at another gate. The usual long walk-run to Heathrow’s chronically under-staffed immigration counters. Business class passengers have a separate set of queues, but this turned out to be a curse, as one of the two counters was busy processing the rejection of an arriving passenger, and the other counter had its share of complex cases which took much longer to process. After an almost 45 minute wait, an additional counter was opened up, and at the other counter, the rejection too was processed, so the queue moved along and I passed through immigration quickly. By the time I reached baggage claim, the bags were just arriving. Collected and was soon on my way. Air Canada offers an arrivals lounge service at London Heathrow, but I did not use it. Ratings: Flight 7/10. Arrival 4/10.